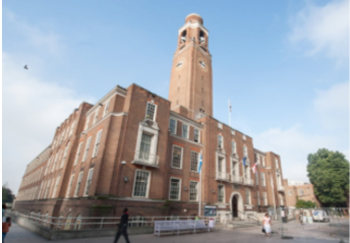 The London Borough of Barking and Dagenham (LBBD) cabinet decided in December 2014, to implement a change of accommodation strategy, optimising utilisation of its office space by implementing a Smarter Working programme and saving £1.9 Million annually from the property budget. I was commissioned to coordinate and accelerate the convergence between Accommodation, People and Technology programme elements of this £11.2 Million property and workplace scheme. Once I had designed the governance / programme structure and agreed this with the Chief Executive and Strategic Directors, we initiated the fast paced engagement with managers and initiated accommodation work which moved senior managers out of their cellular offices into open plan working environments within six months. We secured agreement on a set of smarter working principles which were aligned with the new British Standard code of practice. Through consultation we agreed five work styles across the organisation, with trade unions and staff associations. In ICT Transformation programme was already under way. I defined the requirements to meet the needs of the Smarter Working initiatives and contributed to the selection of equipment, design of the work styles and of the work settings. In addition to the savings in accommodation, the programme was designed to facilitate the broader re-structure being implemented to address the income deficit challenging all local and central government organisations. Smarter Working will pave the way for the new organisational approach being adopted by councils which will reduce the establishment and operate in partnerships commissioning services from a variety of service providers.